London / Singapore: Gold prices rose to a record on Monday in London and New York as investors purchased the precious metal as an alternative to a slumping dollar. The Dollar Index, a six-currency gauge of the greenback’s strength, fell for a second day as better-than-forecast economic growth in Japan added to signs of a world rebound from recession. Asian leaders pledged to maintain stimulus measures until growth is durable, reducing the dollar’s allure as a refuge. Bullion and the currency usually move inversely. “The dollar has shifted so fast from looking fairly strong to looking so weak, boosting gold prices," Walter de Wet, a London-based Standard Bank Ltd analyst, said by phone. “Nobody wants to short gold." Immediate-delivery bullion rose as much as $14.51 (Rs669), or 1.3%, to $1,133.20 an ounce (28.35g) and traded at $1,127.20 by 11.24am in London. The metal added 2.2% last week. December gold futures gained 1% to $1,127.50 an ounce on the New York Mercantile Exchange’s Comex division after earlier reaching $1,133.50. The metal advanced to a record $1,128.75 an ounce in the morning fixing in London from $1,104 at the afternoon fixing on 13 November. Some mining firms use fixings to sell output. “The gold trend is incredibly powerful," Evy Hambro, who helps to manage BlackRock Investment Management Ltd’s $11.6 billion World Mining Fund, said in a Bloomberg Television interview. “Production is declining and reserves are not being replaced." The dollar index slid as much as 0.6% on Monday and is down 7.7% this year. Gold has climbed 28% in 2009 and is heading for a ninth annual gain. The metal has added 7.9% this month as the US currency dropped 1.6%. 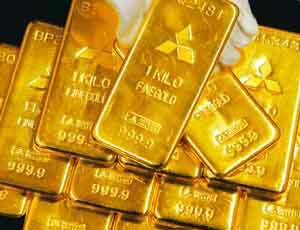 Bullion will advance to $1,300 an ounce, said Wallace Ng, chief dealer with Fortis Bank in Hong Kong. “ It’s not an unreasonable call at all if you look at how the dollar behaves." The Federal Reserve has cut borrowing costs to an all-time low and the US government boosted spending to a record to combat recession in the world’s biggest economy, fuelling speculation that the dollar will be debased. The Reserve Bank of India bought 200 tonnes of gold from the International Monetary Fund last month, and Sri Lanka’s central bank said this month the country will continue buying the metal. “Investors of all levels, from retail investors to central banks, are really diversifying their portfolios," said Toby Hassall, an analyst with CWA Global Markets Pty Ltd in Sydney. Holdings in the SPDR Gold Trust, the biggest exchange- traded fund backed by bullion, fell 0.61 tonnes to 1,113.83 tonnes on 13 November, its website showed. The holdings had reached a record 1,134 tonnes on 1 June. Gold’s rally has pushed its 14-day relative-strength index, a gauge of whether a commodity or security may be set for a decline or gain, to over 70, a level viewed by some investors as a signal for a retreat. Monday’s index was 72.71. “Though technically charts are hovering in the overbought zone, the tipping point seems to be far off and a short-term correction or retracement should not be considered a sell-off," Pradeep Unni, an analyst at Richcomm Global Services in Dubai, said in a report. Among other precious metals for immediate delivery in London, platinum gained nearly 2.7% to $1,430 an ounce, the highest price since 4 September 2008, and was last at $1,417.50. Palladium climbed nearly 2.5% to a 15-month high of $365 an ounce and last traded at $363.25. Silver advanced 1.7% to $17.73 an ounce. Car makers are beginning to replenish platinum stocks and Chinese jewellery demand remains strong, Ian Farmer, CEO of Lonmin Plc, said on a conference call on Monday. Lonmin, the world’s third largest platinum producer, cited signs of improvement in the industry and a possibility of supply shortages in the following two years. Platinum and palladium are mainly used in auto pollution-control gear. Karolina Miziolek in Hong Kong, Haslinda Amin in Singapore and Rebecca Keenan and Jesse Riseborough in Melbourne also contributed to this story.